The Ageing & Development programme works to raise awareness in Ireland of issues facing older people in developing countries, such income insecurity, access to pensions and social protection, access to health care, age discrimination and the inclusion of older people policies and programmes. We aim to increase public understanding of global ageing issues and raise awareness of the role of Ireland’s overseas development assistance in addressing these challenges. We strive to build public solidarity with older people in developing countries by giving them a voice to share their own stories. In particular, we work by building on Age Action’s strong track-record of public engagement and advocacy through engaging in campaigns, outreach, traditional and new media. The programme is funded by Irish Aid and we partner with HelpAge International. Why do we work on this? The world’s population is ageing and this is happening more quickly in developing countries. By 2050, nearly one in five people in developing countries will be over 60. Population ageing transforms economies and societies, and developing countries have less time to adjust to the consequences. Ireland’s overseas development assistance is helping partner countries prepare for the impact of this demographic change. It is vital to include older women and men The Sustainable Development Goals recognise the vital importance of for achieving sustainable development. For further information download the Ageing and Development programme brochure (link below). 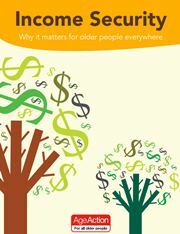 Read our updated booklet on Income Security and Older People here (pdf, 553 KB).